Anderson Cooper shows a photo of Boston Marathon bombing suspect Dzhokar Tsarnaev as he was being apprehended by law enforcement on Friday. Read more about the details of his capture. CNN Senior Legal Analyst Jeffrey Toobin and Former New York City Mayor Rudy Giuliani discuss why Boston Marathon bombing suspect Dzhokar Tsarnaev will not be read his Miranda rights before questioning. President Obama says the coordination between the FBI and police was key in successfully capturing the Boston bombing suspect Dzhokar Tsarnaev after a comprehensive manhunt. CNN's Poppy Harlow describes the cheering crowds after the manhunt ended with the arrest of Dzhokar Tsarnaev, the suspect in the Boston Marathon bombings. The Boston Police Department announced that they captured "Suspect No. 2" in the Boston Marathon bombings, 19-year-old Dzhokar Tsarnaev. The intense manhunt ended when he was taken alive Friday night. Police found and cornered the suspect who was in a boat in a Watertown, Mass. backyard. He had escaped a shootout with authorities that night before that left his brother Tamerlan Tsarnaev, "Suspect No. 1," dead. 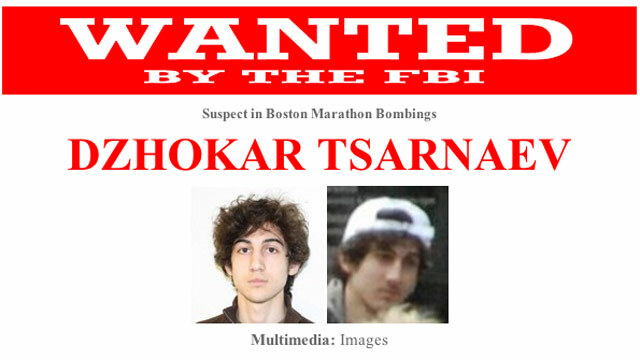 The manhunt for the 19-year-old suspect in the Boston Marathon bombings is not over. But we now know more about the saga that's unfolded in the past 24 hours, including the tragic death of MIT police officer Sean Collier. Dzhokar Tsarnaev and his brother Tamerlan Tsarnaev were identified by police as the suspects in the photos released by the FBI on Thursday at an evening press conference. Hours later the men engaged in a gun battle with law enforcement and threw explosives. Dzhokar got away, driving over his brother who was shot by police. Tamerlan later died at a Boston hospital. A source tells CNN that he was wearing explosives and a triggering device. Anderson will interview the doctor who treated the suspect and also cared for the victims of the attack this week. Today President Obama spoke at a memorial service about the three people who lost their lives in the Boston Marathon attack. He offered prayers and shared memories from those closest to the victims. Lingzi Lu was a 23-year-old graduate student studying mathematics and statistics at Boston University. A Chinese national, she had moved to the city in the fall. Lu and two friends were spectators at the marathon; one of her friends is recovering from injuries and the other was unharmed. A close-knit family of five was torn apart by the violence. 8-year-old Martin Richard was killed in the bombings. His mother, Denise, and sister, Jane, were both severely wounded. A friend of the family told Anderson Cooper that Martin will be remembered as bright, energetic, friendly and faithful, and a leader among his peers.In a statement, his father, William, wrote in part. "We thank our family and friends, those we know and those we have never met, for their thoughts and prayers. I ask that you continue to pray for my family as we remember Martin." Scott Rigsby counsels amputees and teaches them to overcome their fears. He was nearing the finish line during the Boston Marathon on Monday when the bombs exploded. He has since visited the victims who lost limbs in the blast. Rigsby tells Anderson Cooper how he defined his new normal as a double amputee, and how he helps others do the same. Billy and Steffanie Burch ran into a destroyed nursing home in West, Texas to rescue victims after the fertilizer plant explosion. They spoke with Anderson Cooper about the devastating incident. Brice Reed, a paramedic in West, Texas, talks about the community's strength and their shared sorrow over the deadly explosion.